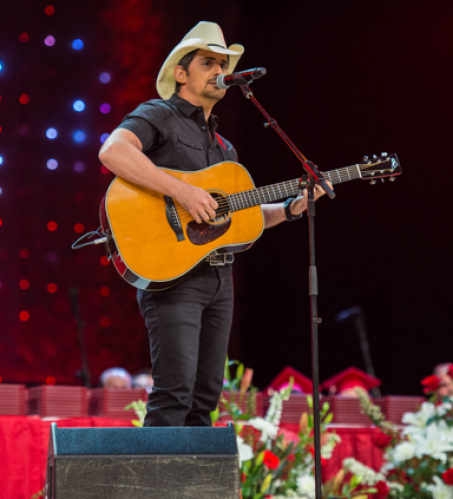 Country superstar Brad Paisley surprised the 754 graduating seniors at Barrington High School, Barrington, IL last evening when he spoke to the class and performed during the graduation ceremony. The surprise appearance was the culmination of a contest for seniors to submit posts on INSTAGRAM or TWITTER answering the question: What “Last Time” are you going to miss most about school? The Barrington High School TV class went above and beyond by creating a fun video that includes mattress surfing down a flight of stairs, pushing their dean into the swimming pool, hitting golf balls on the football field and more. You can view the fun video HERE. Part way through the graduation program Principal Stephen McWilliams greeted the class and guests and then showed the video on the big screen. 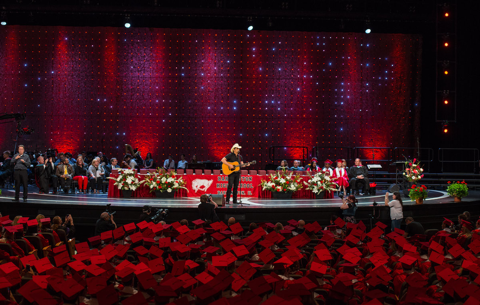 After showing the video Principal McWilliams said, “As I watched this video I wondered what would Brad Paisley say if he was giving this speech?” At that time Paisley walked on stage with guitar in hand and the crowd responded with loud applause. You can watch a portion of Paisley’s appearance HERE.